Left: Karlen made a plot of 25 data series from the NordKlim database. 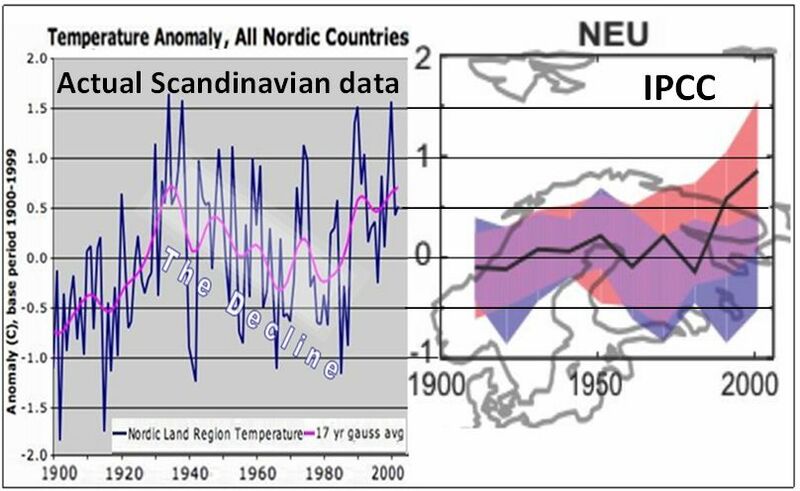 Right: IPCC´s temperature graph for the area does not reflect the actual Scandinavnian temperature graphs. IPCC shows temperatures around year 2000 should be approximately 0,7 K higher than the peak around 1930-50, whereas the actual data collected by Karlen shows that year 2000 temperatures equals the 1930-50 peak, perhaps even lower. 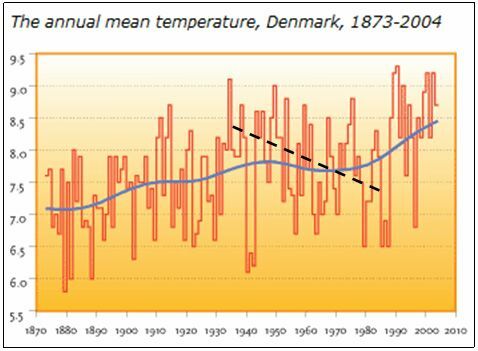 Only Denmark shows slightly higher temperatures around year 2000 than in year 1930-50. 0,1 – 0,3 K warmer? However, the Danish Area around 3% of the overall area. 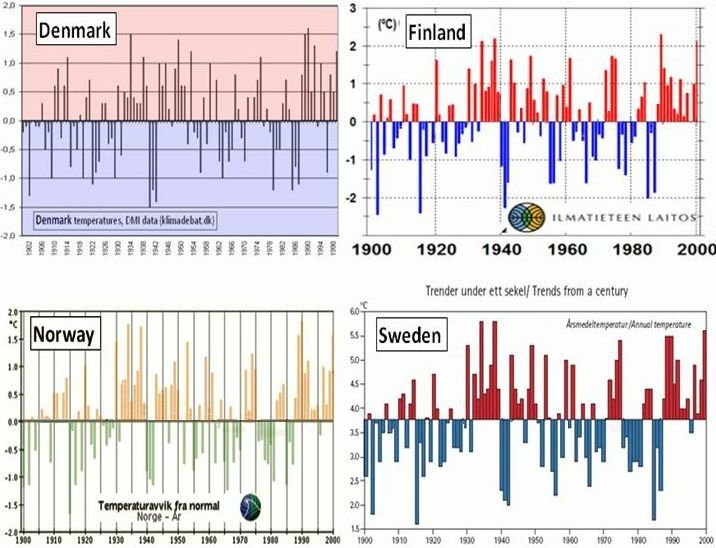 For the vast majority of the Scandinavian area shows year 2000 temperatures just like the 1930-40 peak, Sweden maybe a tiny fall, Norway a tiny increase. Denmark is also the area of Scandinavia with far highest population density, and thus Denmark is likely to show more City heat effects (UHI) than the rest of Scandinavia. So, With good confidence, we can say that Karlens data from Nordklim matches the opinions of the highest authority on Scandinavian temperatures. The very significant temperature peak around 1930-40 has been reduced almost removed totally. And thus the decline in temperatures after 1940 has been hidden. “Why?” and “How?” IPCC did this is basically up to the IPCC to come forward and explain. Until this happends, their vision of Scandinavian temperatures are for their own use only. 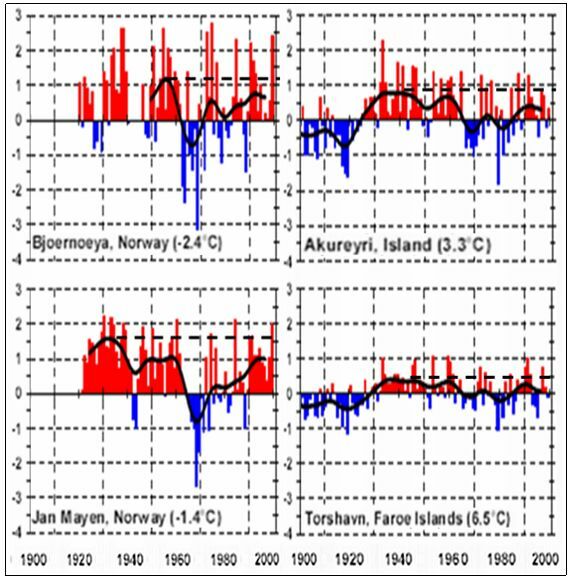 Scandinavian Ocean temperatures indicated from Iceland, Jan Mayen and Faroe Islands actually shows a clear pattern of lower temperatures in year 2000 than in around 1930-40. 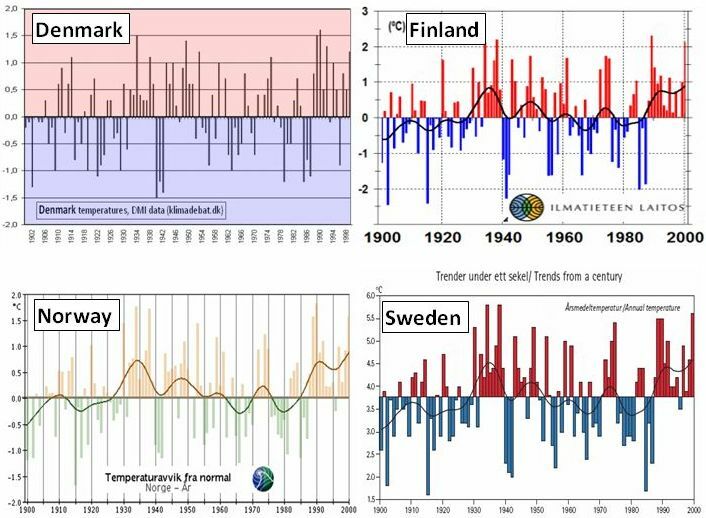 So never mind how we look at it, no shred of evidence to support the IPCC hockey-stick like warming over Scandinavia. And in general we see: The further from population, the cooler temperature trends. Taken from: http://www2.mst.dk/common/Udgivramme/Frame.asp?http://www2.mst.dk/udgiv/publications/2005/87-7614-890-4/html/annh_eng.htm – Black decline trend inserted by me. Somehow, this graphic manages to wipe out the decline after 1935 with a seemingly handmade blue trendline. The blue “trend” graph around 1930-50 shows just a tiny top. Such a trendline could be made by using a middle tempeature for a long period, 50 years? Im just not sure how you can draw a 50-year-average trendline and still draw this trendline up and include the last year of data, 2004? They cannot know what a 50 year average for 2004 is, obviously, so this graph appears to… hide the decline. 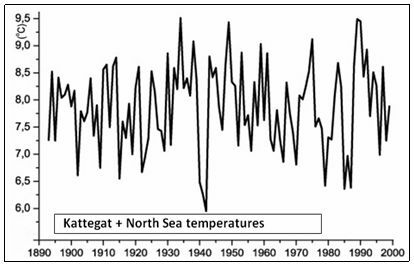 Scandinavian temperatures 1900 – 2000 cleaned from trend lines. Still no sign of global warming in Scandinavia. This entry was posted on 15 februari, 2010 at 9:40 e m and is filed under Fri- och rättigheter, Miljö - Environment, USA, Yttrandefrihet. You can follow any responses to this entry through the RSS 2.0 feed. You can leave a response, or trackback from your own site.